What is the most famous alien race from the original Star Trek series? Well, it’s probably the Klingons. However, considering we only see one example of a Gorn in this single episode, I give the big green guy a close second and true over achiever status. The Gorn is so famous, in fact, that he has made guest appearances on Big Bang Theory and Myth Busters, and Bill Shatner has been recently spotted playing video games with him. So take that, Andorians, Telosians, and Phasians. 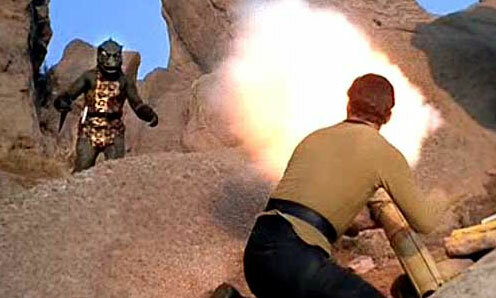 Despite the Gorn’s fame, The TrekQuesters gave this episode pretty weak reviews. Yes, the big lizard costume was actually pretty cool, but anyone who has seen a lizard move knows they’re quite a bit faster than the Gorn’s super slo-mo. And as Myth Busters soundly proved, Kirk was much more likely to blow himself to kingdom come (assuming he could ever actually light his bamboo/diamonds/gunpowder contraption) than to do the slightest damage to that snarling dino-man. The best part of this podcast? Brian’s horrible reception from his Texas hotel room created a truly strange echoing robotic sound effect. And by strange, I mean funny. And what made it even funnier? Andy was still recovering from pneumonia at the time, so he spent the entire hour stifling a hideously painful coughing fit. Hilarious! Do you like lizard men with huge biceps and a lisp? Have you ever sparkled? Could you build a weapon from a broken piece of bamboo? Let us know your thoughts in the comments or send us an email at StarTrekQuest@gmail.com.